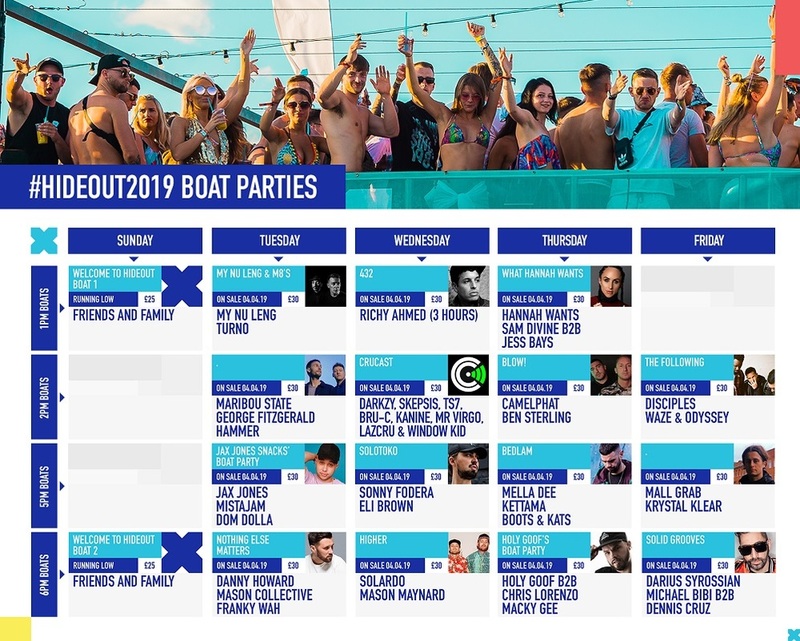 The line-ups for the 17 boat parties at Hideout 2019 have been revealed. Maribou State, Mall Grab, My Nu Leng, Richy Ahmed and Mistajam are among the acts taking to the waves off Zrce Festival Beach in Novalja from Monday, July 1st to Friday, July 5th. Maribou State, will be joined by George Fitzgerald and Hammer; Jax Jones will join a crew alongside Dom Dolla; Franky WAH will board a boat after his beach party debut and Mason Collective will jump aboard with Danny Howard. There will be a female-fronted affair with Hannah Wants, Sam Divine and Jess Bays; Ben Stirling and Camelphat will link up for Blow! ; Mella Dee captains with DJ Kettama alongside Boots and Kats; Holy Goof b2b Chris Lorenzo will have Macky Gee in tow. Crucast will host a boat party with Darkzy, Skepsis, TS7, Bru -C and Kanine among the selectors; Solotoko will invite Eli Brown and Sonny Fedora; Higher have Solardo and Mayson Maynard lined up. Michael Bibi will set sail with Denniz Cruz in a b2b set supported by Darius Syrossian and Krystal Klear will be joined by Mall Grab. Headliners at Hideout this year include BICEP, Jamie Jones, MK, Rudimental and Skream. Boat party tickets go on sale tomorrow (Thursday, April 4th). For tickets and details go to hideoutfestival.com.